This book is collection of stories of reuniting lost loves . They may be lovers,children,sister,boyfriend. Everyone has some person in their in life whose whereabouts they want to know but those people just vanish.Author here introduced a character Cary Maxwell who takes responsibility to unite lost loves.Why read!!? ?..for that you have to read the book. I don't want to ruin the story for you..
We all have someone we want to meet again,to be in love with them.but do they want to ?. People get lost in ,away from your life because they do not want to be found.So,what happens in such a situation .This book has some very lively stories for your answer. Characters Cary Maxwell is described as a person who wants to reunite lost loves ,lovelorn and lovebirds . Then there's Daisy his assistant who is a lawyer ,Rita and Brian .They make up good team. This stories have happy and sad endings.Simple yet meaningful stories. 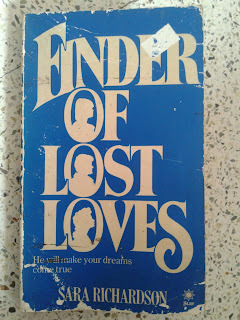 This is book will be hard to find .I bought it from book sale .It's 1985 published book. i also have a hardcopy of this book! it was my mums when she was really young and mine is in a worse condition than urs! but still it feels good to know that someone experienced the same joy by reading this book!